Acknowledge the grievance and any pain that might come with it. Offer a sincere intent to help resolve the problem. If scheduling the conference takes longer than a week, check in with the aggrieved every few days to assure them that they are not being ignored. Express the importance of face-to-face communication to both the aggrieved and the aggriever in finding common ground and resolving conflict. Request that both parties fit the conference in their schedules as early on as possible. Recommend that the aggrieved be present but be understanding if they wish to remain anonymous or not participate. No Personal Attacks. Focus on the problems, not the person. We are all good people who made mistakes. Anger De-Escalation. If anger escalates, remind the party that it’s very important to work together and use the moment as an opportunity to propose solutions or, if it’s too heated, ask the party(ies) to take time to cool out. Assertiveness. Communicate feelings without blaming. It’s very important to promote the use of “I” rather than “You” statements. The Issue. Our position on the issue is irrelevant, the issue itself is relevant. Respect and Agreement. Always be respectful and work toward a common agreement, rather than forcing compliance. Solution. In conflict there are no winners or losers, just solutions. Common Interest. 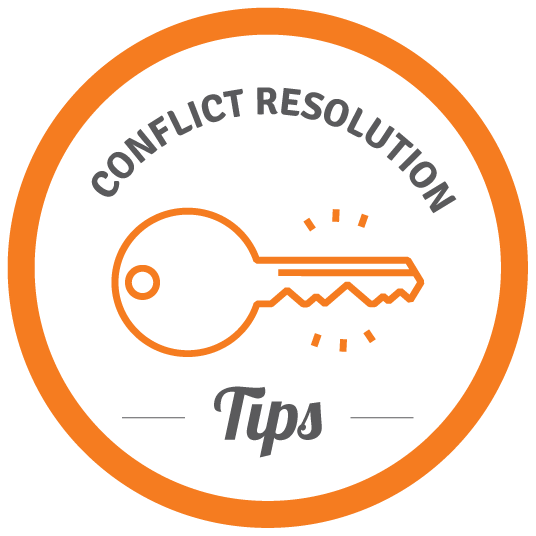 Conflict arises from disagreement but focus on finding areas of common interest. Listen & Check In. Don’t interrupt and double check you understood the issue correctly. Adaption & Be Flexibility. Remain open, adaptable and flexible. Don’t Make Assumptions. Don’t assume what the parties are feeling, don’t jump to conclusions. Ask. Meeting Both Needs. A conflict resolution is successful when the needs from both parties are met. The Power of Community. Our goal is to strengthen our community, never to divide it. Thanks. Thank the parties for taking their time to participate in the Conflict Resolution and thank them for listening. I. Start by “setting the table”. We are having this conference to address an issue and through honest, in-person communication, we believe we can solve it together. Lay out the meeting’s process and order of things. Assure both parties that our role as the Conflict Resolution Team (CRT) is not to propose a solution but to facilitate the dialogue that will result in a solution. We’re here to help, not lead. Write them down, ask for specificity on when and where they occurred. After each answer, check in to confirm its meaning. Paraphrase the answers if needed to guide the conversation forward towards establishing the needs and interests of the aggrieved. III. It’s now the aggriever’s turn to speak. We can begin by asking them to tell their story or by letting the aggrieved to ask them questions. Again formulate the questions to aim at the core reason for the aggriever’s causing the issue, as well as to try and establish their needs and interests. Give priority to the aggrieved to ask questions and only jump in to clarify those or take them further as necessary. Have one CRT member break out with the aggrieved and another with the aggriever into separate spaces (or separate calls). Remind both aggrieved and aggriever about the common ground established at the beginning, about the importance of resolving this conflict and about listening to and communicating to one another clearly. Interject and steer the dialogue back into question-answer format. Ask both parties what caused each of them to get triggered and elevate their tone. Let each person speak one at a time without the other interrupting them. Switch to a recap of progress made so far. Briefly summarize the needs and interests of both parties. If needed, do the recap by phrasing each point as a question to be confirmed: “You said you would like it if XYI and ZIY apologize?” – “Yes.” The more “yes”-es collected from both parties, the higher the likelihood they’ll both regain their positive attitude. Slow down the speaking pace.When asking the next question or doing the recap, speak a little slower than you normally would. Maintain a calm tone and body language. IV. Once all questions have been answered and all needs and interests have been established, we can ask the aggrieved to state their proposed solution. If they still aren’t ready to state one, ask them more specifically what would help them move past this issue, what would make them feel redeemed, and what it would take for them to share the same community space as the aggriever. V. Once the aggrieved states the solution, ask the aggriever if they accept it. Reiterate the points made by the aggrieved about why this solution is necessary and do another progress recap if needed.